Oh, my. I don't even know where to start with describing this DVD that releases today. I told a good friend that I could write this review in about sixty words. If you trust me at all, you just need to go out and GET this DVD. We loved it. The end. She told me that's only twenty-one words. 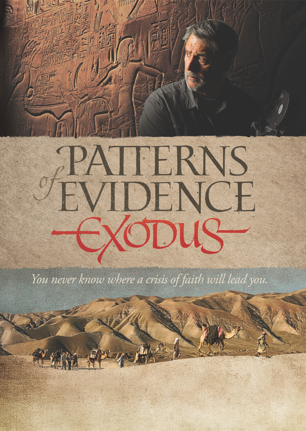 So I suppose that means I have another forty words available to describe just why I think Patterns of Evidence: Exodus is well worth owning. This DVD explores whether or not there is any archaeological evidence to support the story of the Exodus, starting with Genesis actually. They are looking for evidence of Joseph and his family arriving in Egypt all the way up through the sudden departure of a whole lot of slaves. I have to show you the trailer. I don't always embed these things, but I think this gives you a flavor of this 2-hour documentary. This documentary features a dozen or so experts, and experts who totally don't agree with each other and who come at the issues of the Exodus from all kinds of different angles. My kids were arguing back at the screen with some of them, and we had to keep pausing to engage in fairly lengthy conversations. For more than 50 years, the vast majority of the world's most prominent archaeologists and historians have proclaimed that there is no hard evidence to support the Exodus story found in the Bible. In fact, they say that the archaeological record is completely opposed to the Bible's account. This view of extreme skepticism has spread from academia to the world. The case against the Exodus appears to be so strong that even some religious leaders are labeling this ancient account as historical fiction. Filmmaker Timothy Mahoney begins with the questions, "Is the Bible just a myth, or did the archaeologists get it wrong?" He decides to tackle this issue with a deliberate scientific approach. After examining the details in the biblical text, he journeys across the globe to search for patterns of evidence firsthand. The result is the most in-depth archaeological investigation into the Exodus from Egypt ever captured on film. This scientific documentary's goal is to communicate the TRUTH of the Bible and help equip believers with defending their faith and the Bible. The DVD features stunning animations and a cast including narrator Kevin Sorbo (God's Not Dead, Hercules: The Legendary Journeys), interviews with leading archaeologists including Israel Finkelstein, Kent Weeks, and David Rohl, and guest appearances by Israel's Benjamin Netanyahu and Shimon Peres. My teens loved this documentary. The younger two (ages 9 and 11) weren't entranced, and I did not make them watch it. I think in shorter sections, they would really enjoy it too, but it was simply too much information. The animations were pretty incredible. I love all the different perspectives! That one Muslim archaeologist guy was really neat. We ended up having some pretty lengthy discussions about about archaeology in general, ancient dating, whether or not the Bible is trustworthy -- along with discussions about many of the specific points being brought up in the film. This releases TODAY, and I highly recommend purchasing it and the Patterns of Exodus store. I am seriously contemplating the purchase of the books that go along with the DVD. I'm intrigued! And I love all those other words you used to describe it. My gang would enjoy watching and arguing with the TV, as well. ANYTHING history-oriented is going to get my interest up. We are going through the Old Testament with our home school and this would be great while we read Exodus! I love archaeology and how it has proven the Bible to be true time and time again! Thanks for posting this! My husband and I have been waiting years for this movie to come out. I have not seen it, but he has. There is no doubt will we have this DVD in our home at some point!